Attorney General Holder just put out a new policy on marijuana prosecutions. The memo applies to all federal enforcement activity, including civil enforcement and criminal investigations and prosecutions, concerning marijuana in all states. Federal prosecutors use the Controlled Substances Act (CSA) for marijuana enforcement. Florida is not one of those states that legalized marijuana for medical purposes. The memo may be useful to forestall a prosecution in states that have legalized marijuana for certain purposes. The memo really does not establish a clear policy, but here are some excerpts and a copy of the memorandum sent out to Assistant United States Attorneys. "In October 2009 and June 20 11, the Department issued guidance to federal prosecutors concerning marijuana enforcement under the Controlled Substances Act (CSA). This memorandum updates that guidance in light of state ballot initiatives that legalize under state law the possession of small amounts of marijuana and provide for the regulation of marijuana production, processing, and sale. The guidance set forth herein applies to all federal enforcement activity, including civil enforcement and criminal investigations and prosecutions, concerning marijuana in all states." "These priorities will continue to guide the Department's enforcement of the CSA against marijuana-related conduct. Thus, this memorandum serves as guidance to Department attorneys and law enforcement to focus their enforcement resources and efforts, including prosecution, on persons or organizations whose conduct interferes with any one or more of these priorities, regardless of state law." Preventing marijuana possession or use on federal property." "The enactment of state laws that endeavor to authorize marijuana production, distribution, and possession by establishing a regulatory scheme for these purposes affects this traditional joint federal-state approach to narcotics enforcement. 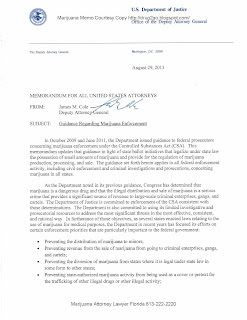 The Department's guidance in this memorandum rests on its expectation tkat states and local governments that have enacted laws authorizing marijuana-related conduct will implement strong and effective regulatory and enforcement systems that will address the threat those state laws could pose to public safety, public health, and other law enforcement interests." "As with the Department's previous statements on this subject, this memorandum is intended solely as a guide to the exercise of investigative and prosecutorial discretion. This memorandum does not alter in any way the Department's authority to enforce federal law, including federal laws relating to marijuana, regardless of state law. "